Before he became known as the man behind The Love Boat, Fantasy Island, Dynasty and many other Seventies television staples, producer Aaron Spelling scored an earlier success as the executive producer of The Mod Squad, ABC Television’s wildly popular action crime drama series which ran for five seasons from 1968 through 1973. Clarence Williams III (l.), Peggy Lipton and Michael Cole are The Mod Squad. 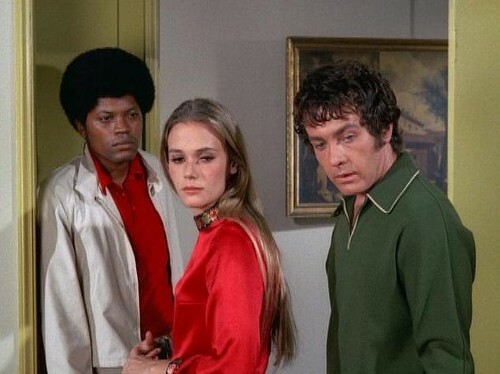 The show revolved around three youthful, cool and beautiful young people – angry rich kid Pete (Michael Cole), angrier black dude Linc (Clarence Williams III), and runaway flower child Julie (Peggy Lipton) – who become undercover cops in the Los Angeles Police Department. (They don’t want to, initially, but it’s a better alternative than going to jail as they’ve all been arrested for breaking the law.) Being products of the flower-child era, they don’t carry guns or make any actual arrests (the uniformed cops take care of that part of it), but they quickly prove their worth as the hippest undercover investigators on the block. Over the course of the series’ run, they come up against and deal with such controversial issues as racial politics, drug culture, anti-war sentiment, soldiers returning from war, student unrest, abortion, spousal abuse, child neglect, illiteracy and slum lords—not to mention good old fashioned murder and theft. Oh, and all of it’s set to a rockin’ Sixties musical score. 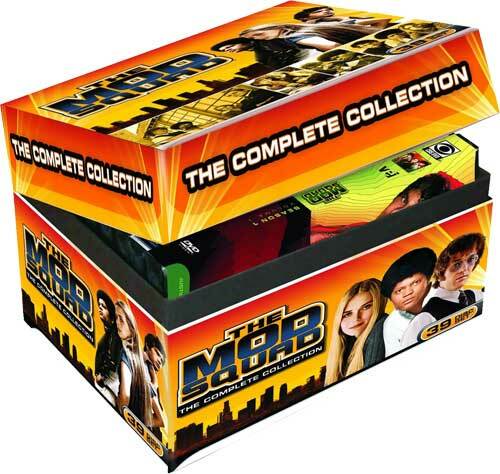 VEI’s handsomely packaged 39-disc collection offers all 123 episodes from the series five-year run (minus the 1979 TV movie The Return of Mod Squad, which reunited the trio for one final late-Seventies adventure). The only bonus features on the collection come in the form of a quartet of featurettes. The best of the bunch are “Forming the Squad,” which examines the creation of the show and its initial production, and “Inside the Teeth of the Barracuda: 1968,” which examines what was going on in the U.S. during the volatile year that the show premiered. Also included are Friends of the Mod Squad, which presents a round-up of the series’ many guest stars (which included Sammy Davis Jr. and such “up-and-comers” as Robert Duvall, Louis Gossett Jr., Richard Pryor, Martin Sheen and Richard Dreyfuss Finally, there’s “Hello, My Name is Julie,” which takes a colorful look at Peggy Lipton’s colorful period wardrobe. All four of the bonus features originally appeared on an earlier DVD release of the show’s first season. The collection is available directly from VEI at the discounted price of $129.99 at the VEI homepage (link).